MADISON, Wis. — Near the conclusion of Sunday night’s Eagles of Death Metal show, it seemed like the forces of darkness had finally taken over. A mustached, black-clad figure stood center stage, half concealed in shadows, urging the frenzied audience to chant a demonic refrain. “Who’ll love the devil?/Who’ll sing his song?/Who will love the devil and his song?” the crowd bleated. Any curious by-stander who wandered into Madison’s High Noon Saloon for a late-night brew might have thought he/she had stumbled onto a rock ‘n’ roll coven dragging Halloween celebrations on a bit too long. But the devil that the fist-pumping throng was hailing wasn’t the Evil One. Instead, they were worshiping the Eagles’ greasy-haired, super-charged frontman Jesse Hughes, whose sinister nome de guerre perfectly fits a man who has shown a nefarious ability to deceive snobby rock fans into cherishing his predilection for rock’n’roll cliches — hot rods, tattooed ladies and riffalicious boogie-rock. There was no evil at work as Hughes and his three backing musicians enthusiastically plowed through their faux sleazy, strutting rawk for a firey hour and a-half. The band’s set equally parsed between the Eagles’ best cuts as well as new ditties, which are getting the promotional push during this brief U.S. tour. On this night, all the manic cheers the Eagles got, they earned. For the fast-talking, mulleted Hughes, this adulation clearly left him beaming Sunday night. In fact, such were his giddy spirits that his handle-bar-moustache-wrapped smile couldn’t be diminished by power supply problems and a pair of (gasp!) damaged sunglasses that apparently delayed the show. But there was something else too. A few songs into the group’s show, Hughes excitedly confessed that he just learned the new Eagles’ record had entered the Billboard pop charts at a surprising No. 57. The Eagles are finally gaining more converts. This surge of success is certainly affirmation for Hughes, who has made the quick-paced transition from reporter to rocker in five short years and has seen his studio pet project bloom into a full-blown, Harley riders’ rock fantasy. With two tricked-out discs under their belts and a third, slicker one, “Heart On,” hitting stores last week, the Eagles are finally positioned to step out of the long shadow cast by the more famous band that Hughes’ songwriting partner calls home. The party in question is Queens of the Stone Age leader Josh Homme, who shares credit with Hughes and produces the Eagles’ records. While the pair each guides the project in the studio, it’s understood that Hughes is on his own when taking these neo-blues/rockabilly tunes on the road. This time around, Hughes was able to enlist several of Homme’s frequent associates to flesh out the group’s live sound. He poached Queens hard-hitting drummer Joey Castillo as well as occasional Queens collaborator, guitarist Dave Catching, and both players transformed the often low-fi templates into hip-shaking anthems while keeping the Queens’ aggressive, fun-loving spirit front and center. What makes Hughes such an eccentric is how he’s conceived the Eagles of Death Metal as stubborn revivialists who seek to resurrect a part of the genre’s forgotten past. Somewhere along rock ‘n’ roll’s 50-year history, the rock took precedence over the roll and the music became allergic to a dance beat. The Eagles, however, see the ensuing decades in which rockers didn’t appease retro-bobby sockers and greasers as years largely spent on a musical sidetrack. Hughes’ goal is to return the groove to its place of primacy in the songs and he doesn’t mind roiling with irony and cultivating a rock-star image in the process. Just like current chart-toppers AC/DC, the Eagles’ music is arresting despite the fact that the songs are constructed using the same basic building blocks. Every track starts with an infectious drumbeat, a few gravelly, Rolling Stones chords, Hughes’ tough-guy falsetto crooning and a few imitations of wrestler Ric Flair’s trademark hooting. And presto! The band has a formula for a limitless stream of raucous jams. To prove his point, Hughes kept the intensity up as the group hammered their stylistic mantra home in countless ways and each one completely thrilling. New track “Anything ‘Cept The Truth” roared with the savagery of the “Search And Destroy”-era Stooges while the locomotive riffing of “I Want You So Hard (Boy’s Bad News)” chugged along like the Queens of the Stone Age B-side that it could have been. The magnificent “So Easy” retained all the audio charms of corrosive riffs, pulsating drumming and con-artist crooning that could have made it a hit single. A cover of Stealer’s Wheel’s “Stuck In The Middle With You” was given the Eagles treatment and fit right in. Such was Hughes and company’s over-the-top swagger that the straightforward sentimentality of “Heart Value” and especially “Now I’m A Fool” were hard to take on face value. “You went Hollywood on me,” Hughes whimpers with super-sincerity, but when he claims in the verse that he’s a fool, it’s not over love. He’s a fool only because he thought listeners could take such a saccharine arrangement seriously. Fans might have thought it was just another gag. There was no fooling during the encore, when the group brought some of their heaviest hitters from all their albums. The riffs of “Cherry Cola” snarled like the souped-up descendants of Steppenwolf’s “Born To Be Wild” while Castillo tried to bash his kit into dust with an avalanche of complicated drum fills. Newbie “Cheap Thrills” has the most pulverizing guitar lines that segue into a heavenly bridge that clearly showcases Homme’s influence. But it was “Speaking In Tongues” that brought all the metalheads and punks to the dance floor to try out their best moves. It wasn’t a pretty sight to see, but the band’s performance mostly compensated. Sunday, Nov. 16, Brooklyn, N.Y.
Tuesday, Nov. 18, Washington, D.C.
Thursday, Nov. 20, West Chester, Penn. Friday, Nov. 21, Raleigh, N.C. 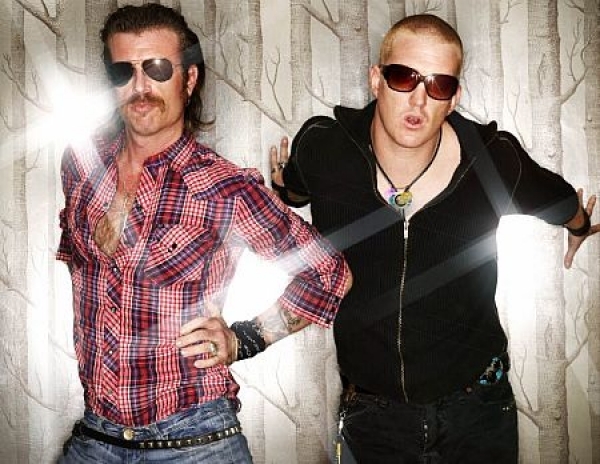 Tags: Eagles of Death Metal, High Noon Saloon, Jesse Hughes, Josh Homme, Madison, Queens of the Stone Age, review, Wisconsin. Bookmark the permalink.